BLACKSBURG, Va. (AP) Virginia Tech doesn’t have the array of 3-point marksmen that helped the Hokies return to the NCAA Tournament last season. That means Buzz Williams and his band of overachievers will have to pay more attention to another facet of the game: Defense. Virginia Tech led the Atlantic Coast Conference in 3-point field goal percentage (.403) and 2-point field goals percentage (.548) a season ago, but lost its top scorers in Zach LeDay (16.5 ppg, 7.3 rpg) and Seth Allen (13.3 ppg, .441 3-point percentage, 107 assists). They left huge holes to fill. 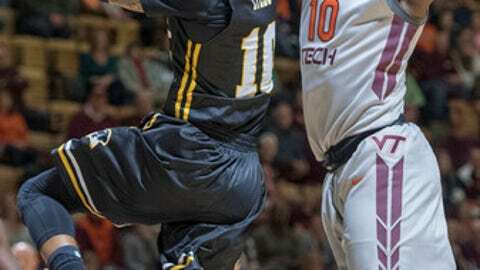 The Hokies suffered another huge blow when Ty Outlaw (who hit 57 3s and shot .489 percent from behind the arc) was lost for this season with a torn ACL. They could also be without versatile Chris Clarke, arguably their best player, for at least part of the season if not all of it while he recovers from ACL surgery. ”I don’t know if I’ll play or when I’ll play, but just trying to be patient,” Clarke said, noting that Williams errs on the side over being over-protective when forecasting his return. The losses leave Virginia Tech thin on experience, and counting on three freshmen and one redshirt freshman to be ready to quickly contribute. The Hokies will have six players with significant ACC experience, but two of the six – guard Devin Wilson (redshirt) and forward Kerry Blackshear Jr. (injury) – didn’t play last year. Significant returnees include guards Justin Bibbs (9.2 ppg, 67 3s), Justin Robinson (10.4 ppg, 160 assists) and Ahmed Hill (11.4 ppg, 59 3s). GLASS CLEANERS: Blackshear is 6-foot-10 with low post scoring skills, but will need to add rebounder and defensive stopper to his resume. He played in 35 games as a freshman and averaged 6.2 points and 4.5 rebounds. CLARKE OR NO? Williams says Clarke is the team’s best rebounder; he shared the team lead with LeDay last year at 7.3 per game. Williams says the junior, who plays with reckless abandon and gives the Hokies energy, may also be the team’s best passer. Getting him back in uniform with tremendously help Virginia Tech’s fortunes. FRESHMEN READY? Williams says lack of depth will force the Hokies to depend on contributions from freshmen SG Nickeil Alexander-Walker, PG Wabissa Bede and F P.J. Horne ”from an early point” in the season. Alexander-Walker is the highest rated recruit of the three, and the others averaged better than 25 ppg as high school seniors. Their biggest adjustments are likely to be playing defense to Williams’ standard.